Do you want to restore your vintage bathroom fixtures? Clawfoot bathtub refinishing can return the original charm and beauty to Victorian clawfoot bathtubs, pedestal sinks, and antique lavatories. Miracle Method has nearly 30 years of experience in cast iron tub refinishing and the repair and restoration of clawfoot bathtubs and other vintage bathroom fixtures. All antique bathroom fixtures are a work of art that deserve an experienced Miracle Method craftsman to restore them. Fortunately, our unique process can make any porcelain finish as bright and glossy as the day it was manufactured. Even deep porcelain chips or cracks can be repaired. Our craftsmen have restored 100 year old barnyard bathtubs through cast iron tub refinishing, as well as Victorian bathtubs and pedestal sinks in historic hotels. While new acrylic and Acrastone™ reproductions are being sold, nothing matches the look and quality of antique, cast iron vintage bathroom fixtures. 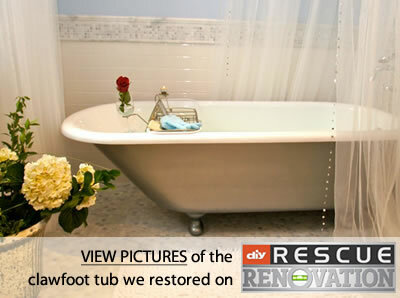 A clawfoot tub is often the centerpiece of a bathroom remodeling project. You have many choices as to size, style and shape of tub. Miracle Method can help guide you through the restoration process and custom refinish your antique. Miracle Method clawfoot tub refinishing! 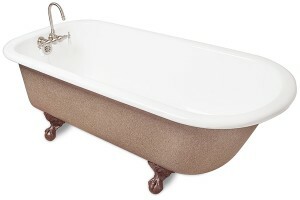 Clawfoot bathtub refinishing is not limited to any color. While the most common interior color is white, almond and bone are also popular. And while it wasn't common in most reputable houses of the early 1900's, candy apple red is also an option! 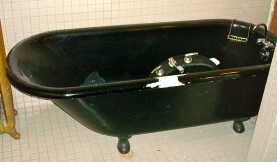 The exterior of most clawfoot bathtubs is rough, exposed cast iron. 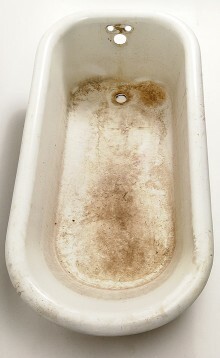 For cast iron tub refinishing, the first step is to have the exterior sand blasted to remove old paint, rust, and corrosion. After that, one option is to have the rough exterior filled and sanded to be smooth and glossy. The exterior is then sealed and refinished in any solid color or one of our Natural Accents™ stone finishes. Clawfeet are in a class by themselves. Some are fairly simple and plain. Others have bold designs or incredible detail of animal claws. They can be refinished to match or contrast with the exterior, but the recommended treatment is to have them plated in chrome, nickel, bronze or even gold. It’s up to you. Once your tub is refinished, Miracle Method can assist you in finding antique reproduction faucets, handles, drains, and overflow covers to make your antique tub functional. Refinishing brought new life to this old beauty! 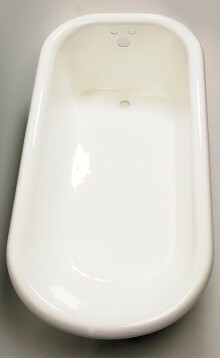 Miracle Method specializes in clawfoot tubs and other period fixtures, including farmhouse sinks. We have the best porcelain refinishing process and craftsmen in the industry to provide a durable and beautiful restoration. Inside refinished in glossy white. Outside refinished in Natural Accents. 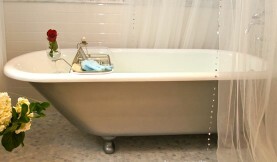 Many Miracle Method locations stock unfinished clawfoot tubs and other antique fixtures. If you want a clawfoot tub or pedestal sink, call us and we’ll be happy to custom refinish and restore one for you. To learn more about clawfoot bathtub refinishing and vintage bathroom fixture restoration, click on Find a Location or call our toll free locator number, 1-888-271-7690 to reach the nearest Miracle Method professional.